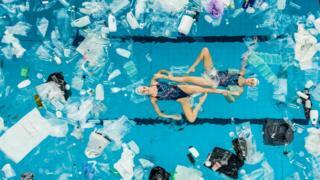 Two British synchronised swimmers have been challenged to twirl and kick in a pool full of plastic to highlight the world's pollution problems. 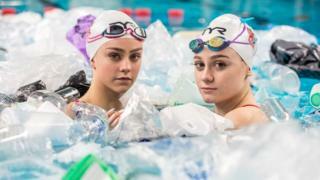 Teenagers Kate Shortman and Isabelle Thorpe struggled to perform their usually flawless routine in a swimming pool filled with plastic drinking bottles, toiletries, carrier bags and containers. It's the kind of plastic rubbish that is being dumped into the world's oceans, which causes serious issues for marine animals. Isabelle said: "Trying to do our routine in a pool full of plastic was really hard. We kept getting our legs stuck in the bags and bopping our heads on bottles." 'It really hit home how awful it must be for the poor turtles and other sea life that go through that every day, so to hear so many people our age are using science and technology to come up with solutions to help this situation for the future is really great." The challenge was made by The Big Bang Fair, which is taking place at the NEC in Birmingham this week. It aims to get children to use their science, technology, engineering and maths skills to tackle environmental issues such as plastic pollution in the world's oceans. So much plastic - everywhere.